Jeff and Teresa Metke, the team behind Metke Remodeling & Luxury Homes, completed the remodel of their traditional midcentury ranch house in a quick five months. This total home remodel took an aging two-story daylight ranch down to the floor line, leaving only the basement and garage intact. The main floor was reoriented and square footage added toward the canal to create a flowing indoor-outdoor living space full of light and charming views. 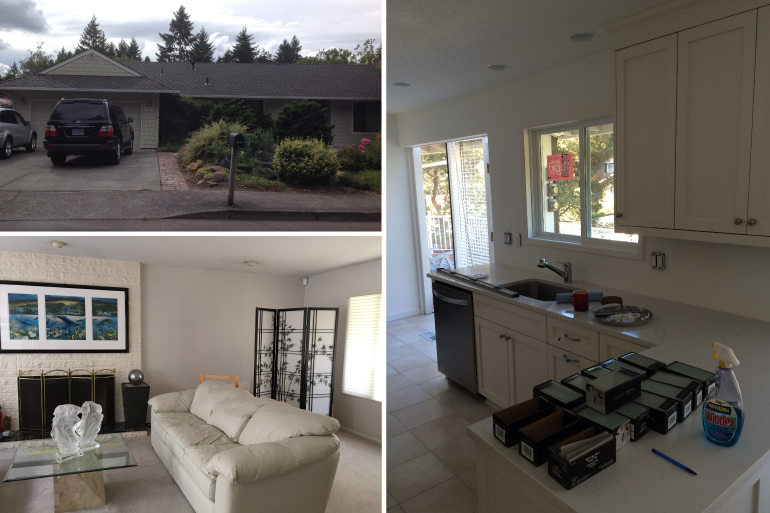 Jeff and Teresa repurposed what they could from their former home and the original ranch. Storage cabinets from the old garage and kitchen cabinets from the original kitchen moved into storage and laundry spaces with new facings and hardware. An older refrigerator got a custom facade to tie in with the downstairs kitchenette — which also uses the original kitchen dishwasher. Toilets and a bathtub were also repurposed. Strategic window placement in the home orients it toward the canal while providing abundant light without sacrificing privacy. “Out every window is a beautiful view, and there is hardly a window blind necessary for privacy,” says Teresa. On the occasion they do pull a blind, an innovative new product from the Hunter Douglas brand allows a seamless shift of sheer and opaque fabrics. 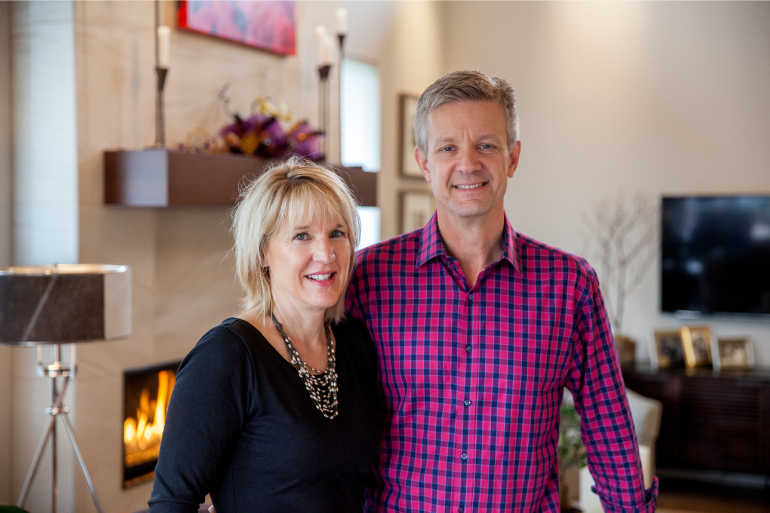 Jeff and Teresa Metke form the foundation of Metke Remodeling & Luxury Homes, a family-run business. Jeff Metke is the recipient of a 2016 Remodeler of the Year award from the Home Builders Association of Portland. The home is also designed to see the Metkes throughout their remaining stages of life. 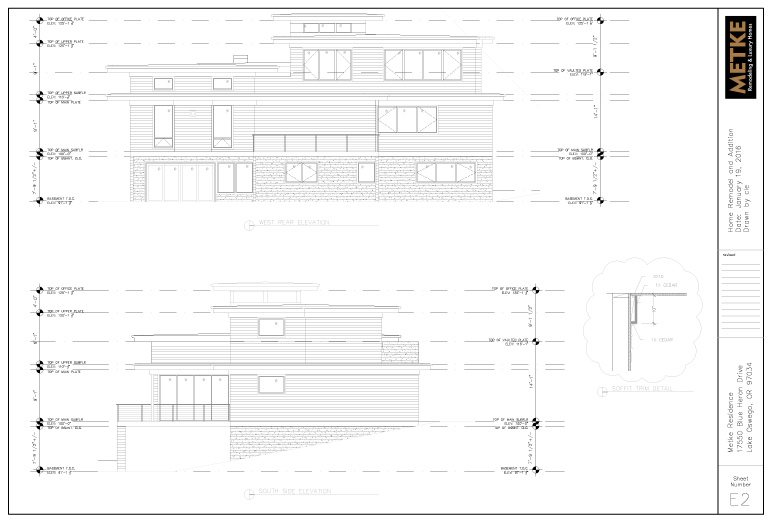 Jeff, a Certified Aging-in-Place (CAPS) specialist, approached the design to maximize how they live now and how they want to live in the future. Creating a self-sufficient living space downstairs for their younger son gives him the option to remain at home longer (if he chooses) while completing college. Once they are empty nesters, the space can be used as a mother-in-law suite for aging parents. Two levels of outdoor space give all ages unfettered access to functional four-seasons living. 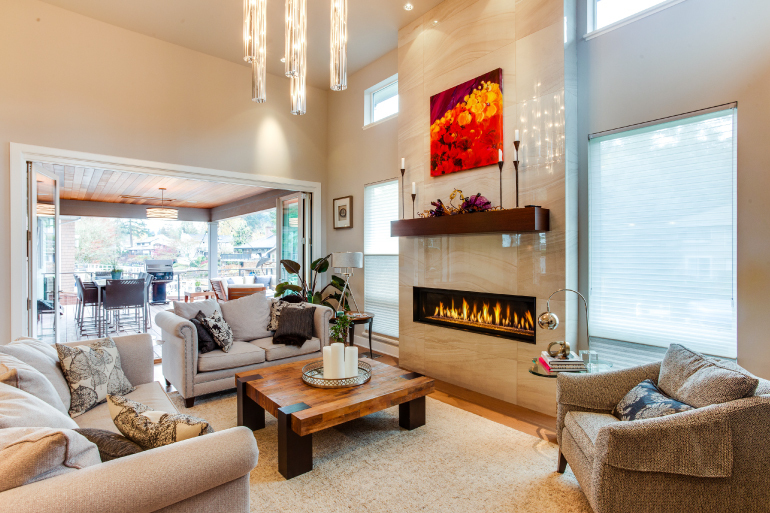 Floor-to-ceiling glass doors open the upstairs fully to the patio, while inset lights and heat lamps keep it cozy. A poured-concrete fire table by Cement Elegance out of Bend, Oregon, acts as a gathering place. Teresa deploys a neutral color pallet throughout, adding interest with textural elements. 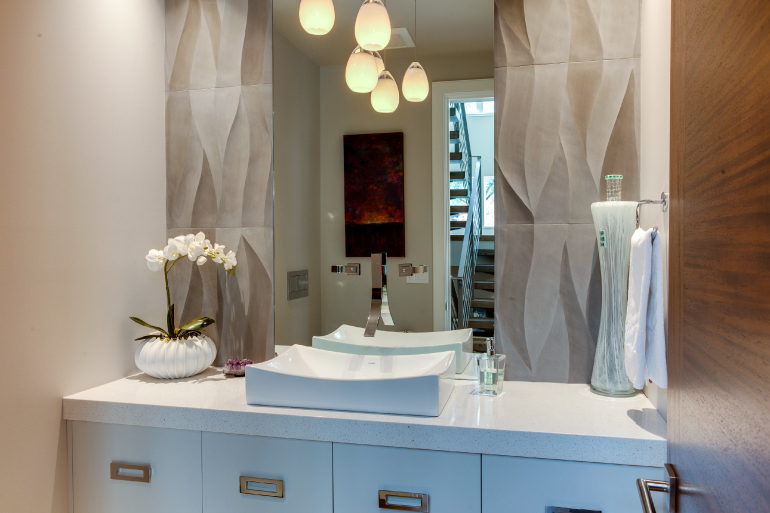 Hand-carved tiling in the powder room was sourced from Oregon Tile & Marble. Vinyl flooring from Armstrong, sourced at Contract Furnishings Mart (CFM), throughout the basement has the beauty and texture of tile while being hard-wearing and warmer to the foot. “CFM is our go-to source for most interior finishes. Vinyl flooring has come a long way. A tiled approach makes it simple to replace a damaged portion, while its flexibility on uneven surfaces makes it a great choice for older-home remodels. It’s also very budget-conscious,” says Jeff. 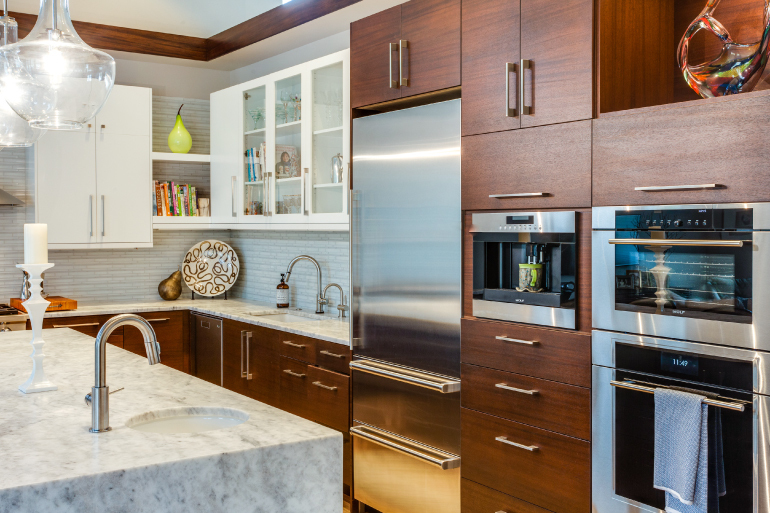 Top-of-the-line kitchen appliances, smart home features and unique lighting give the house a sophisticated but approachable vibe. Teresa’s expertise with melding natural light, task lighting and accent lighting makes every room infinitely inviting. Luxe details like a small chandelier fixture in the master bedroom closet don’t overpower the home’s artful balance of modern and traditional elements.